RIP wallets, implanted microchips are here to stay. Wallets are such a bother. They flop around your pocket or purse, swelling as they munch on rarely-used loyalty cards and superfluous receipts. But we’re living in the freakin’ future now. Why do we still have to lug around several different credit cards, or keys for irritating doors to the car and the office, when technology has far surpassed the need for any of them? Lots of people are moving to store these sorts of things in their smartphones, of course, using services like Apple Pay and smart locks. But phones can be lost and hacked. So a growing number of people — including, for whatever reason, about 3,000 Swedes — are opting for something even more invasive, and arguably practical: a surgically inserted microchip, according to the Associated French Press. The chip itself essentially acts as a digital keychain. NFC (near-field communication) is a way of sending information wirelessly from a passive chip to a reader, but only when they are about 4 cm (1.6 in) apart (you might have heard of radio frequency identification, or RFID — NFC is a more sophisticated form of it). A chip in the hand can help people do things like sign into the gym, unlock doors to cars and offices, and make credit card payments. Over time, as the technology progresses, the implant will be able to do even more. The technology itself is not new. In fact, Swedes (and others) have been using microchips this way since at least 2015. Even before then, groups of people have been meeting at “implant parties,” often organized by larger companies, to hook themselves up. And the chips are similar to the ones veterinarians implant in dogs and cats so that their owners can find them in case they run away again. 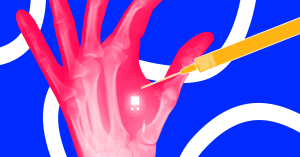 But now, people who get the implant aren’t counterculture biohackers — they’re the everyman. This is especially true in Sweden, where these chips are so mainstream that, since June 2017, people have been able to buy train tickets with their microchips. More bodies equipped with microchips doesn’t necessary sound like good news to everybody, however. NFC chips right below the skin give corporations a fair amount of control over you — they could track where you are, how long you take for lunch every day, or how many times you went to the bathroom, if the chip were scanned by a reader. And since most chips are offered through big companies, it’s just a matter of time until this happens. And opting out of this kind of data collection is a lot more convoluted when you’ve got a chip implanted in your bodily tissues. If you want to go off the grid in even the smallest way, you can leave your wallet at home, but removing a microchip requires bit more, uh, effort. And then there’s the obvious data security concerns. No internet-connected data, no matter how secure it may seem, is safe — even NFC can be hacked with the use of a specialized reader and a lot of coding skills. Smartphones have tackled this security problem by combining NFC technology with biometric readings, like your fingerprint. But microchips like these don’t have such security, which could make your personal info more vulnerable to hacking. So, we get it, Sweden — you’re populated by futuristic cyberpunk badasses while most of us are still stuck with humdrum brass keys and overstuffed wallets that bulges like a recently-fed snake. But without additional safeguards, and guarantees of online privacy, the microchipping fad may quickly become a digital security nightmare. EV-Charging Roads Have Arrived. Here’s Why We Do (and Don’t) Need Them.